There are many thousands of moth species in Australia, an estimated 30,000 or more, compared to only 400 species of Australian butterflies. Only about 12,000 species of moths have been described and comparatively few have been studied to any great extent. Generally only if they are a pest on food crops and then only to find ways of controlling them. Because so little is known, events like land clearing and controlled burns can eliminate a species without ever discovering their benefits. There are some caterpillars in the family Oecophoridae that help breakdown the leaves on the forest floor, birds and animals hunt for these insects turning over the leaf litter and creating compost. Others species live on lichens, some on insect eggs, some on spider eggs, seeds, flowers, fruits, leaves, branches, bark, plant galls and many other food source, including one that lives on Koala dung! Some moths only breed on one species of plant and the removal of these plants during clearing can lead to the extinction of that species. From a gardening point of view, the more we plant species native to our particular local area the more we achieve a better balanced ecosystem. Damage from caterpillars is rarely a problem and the increase in the number of beautiful moths is significant. For plants of the Toowoomba and near areas, (depending on soil type), see the “Toowoomba Plants” link in the right margin. 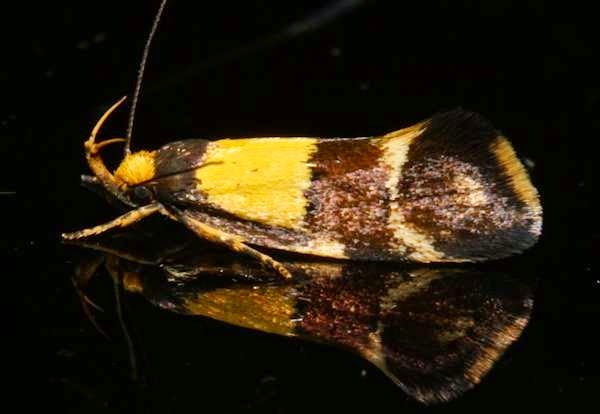 Although tiny, some moths in the Oecophoridae family are brightly coloured. In general they also have the sharp upturned labial palpi, (these are the "tusks") you can see on the front of the moth, and are sensory organs. Body length about 8mm. I don't know what this one eats but the majority of the family live on Eucalyptus trees or in the leaf litter under them.